You may associate emeralds with the colour of the bright green grass that pops up in spring, but did you know that this vibrant green gemstone is associated with unconditional love? That’s not all: Ancient legends link emeralds with the ability to provide protection from evil while helping the wearer peek into the future. We’ll cover a few astonishing legends here. 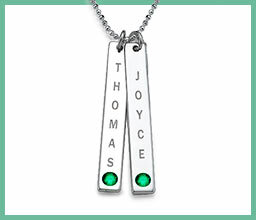 At My Name Necklace UK, we love the beautiful green of emeralds, and we’d like to remind you that you can wear these stones even if you weren’t born in May! 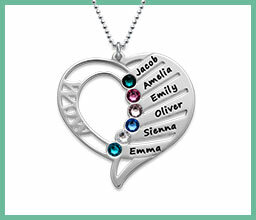 Our birthstone jewellery collection is like no other, with many classic and contemporary styles to choose from. Which is your favourite? Emeralds are part of the Beryl category, with a beautiful green colour that comes from the metallic elements vanadium and chromium. 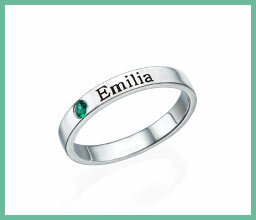 The word “Emerald” is derived from a combination of the Latin word smaragdus and Old Greek word smaragdos. Both words translate to “green gem.” In ancient times, emeralds were mind at Egypt’s Mount Smaragdus. Cleopatra, Jacquelyn Kennedy, and Elizabeth Taylor were some of the most famous wearers, and many modern brides like to carry the tradition forward. When you wear emerald jewellery of any kind, you’re wearing a unique symbol of love! Significant milestones are best celebrated with meaningful gifts! We love birthstone rings for mothers as an example; the stones signify children, and these rings are often quite colourful. 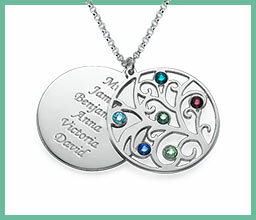 Family tree necklaces offer another way to celebrate Mum’s loving bond with all of her children, whatever their ages.